Little Lost Sheep opens with this screen. Every time the app is launched, this is the first screen you see. That way, the toddler recognizes the start of the game. With the green button, a new game is started. The green button is used on every screen when interaction is required. This is done to make the interface as easy as possible for the toddlers. In the top-right screen, you will find a small info-button. This button opens the settings screen where you can disable audio and select the game mode. You can also find the buttons here to contact us or the visit the website! Before you start a new game, you have to choose who will be the shepherd: you or your toddler. 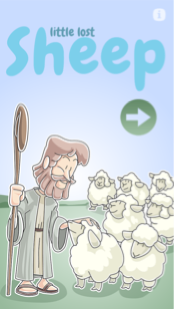 This screen (and the built in voice over) invites the shepherd to close his eyes. The shepherd should keep his eyes shut until the phone is hidden. The shepherd on this screen has a small animation (as on every screen) that shows the toddler what to do: to close his or her eyes. Did the shepherd close his eyes? Then hide the phone somewhere in the room! In a shoe, in the doll house, behind the coach or in another smart place! As soon as the phone hasn't moved for 3 seconds, the screen goes black and the phone 'transforms' into a sheep. This little lost sheep starts to blaaa every 3 to 10 seconds, depending on the game mode. 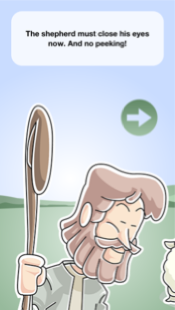 The shepherd can now start to find the phone / sheep. That's a lot of fun for sure!! 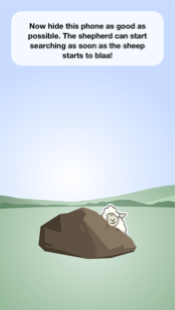 Did the shepherd find the phone / sheep? Then he or she must touch the screen. After that, the screen you see on the left is shown! 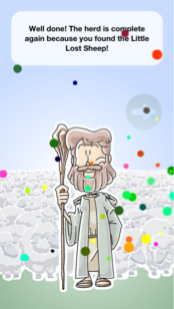 Music is played, confetti is flying around and the shepherd on the screen is very happy! Want to play again? Then switch roles and use the well known green button to start with the first screen again.